Our USA made AXN™-83' Model 2 Guitar features replica-level detail. All the woods and hardware are based on lab analysis of the original Kramer 1983 Baretta. This includes exact headstock shape and exact neck profile and fretboard radius. With true-to-the-original thin hand-sanded primer and finish. This guitar is the most complete, accurate and refined reincarnation of the guitar that forms the legend. Every detail was meticulously perfected and manufactured here in the United States of America. The original 1983 Kramer Baretta is considered by many to be the pinnacle of the 1980s electric guitars. Today, any one of the 200 original 1983 Barettas that were built commands thousands of dollars. Our AXN™-83' is an amazingly accurate hand crafted artist's replica of these highly valuable vintage guitars. Its rendered in detail so intricate that you'll find yourself confusing ours for the real thing. The AXN™- 83' is very simply the best guitar you can buy today. Our AXN™- 83' is the Holy Grail but better and with a beefier footprint. Experience the ownership, playability and tone of an original. With a launch date July 2019 this Special Edition AXN™-83’ Custom is for those that can appreciate the EXACT DETAILS of the original Kramer 1983 Holy Grail Baretta including a maple body just like the original. Boasting the only perfectly shaped Holy Grail Banana Headstock neck available ( Aka Hockey Stick or Large Non-Angled Headstock ). The AXN™-83’ Custom includes the same species of maple in a guitar body shaped exactly like the original 83 Baretta. The AXN™-83’ Custom includes an early 1980s style wood screw tremolo posts and a black Floyd Rose Tremolo. We worked hard and nailed the AXN™-83’ Custom adding the original Kramer rear control cavity shape which is different from our standard AXN™-83’. In this streamlined version the identical 1/2” threaded input barrel jack pushes it closer. Save the Hockey Stick headstock shape, the necks unique rosewood fretboard and oil finished back, and the fabled 1-3/4” nut size, and you have The AXN™-83’ Custom. Available now our Standard AXN™-83' is a boutique, hand-made, highly superior electric guitar with AXN™ Guitar DNA packed inside and out. This AXN™-83’ Standard incorporates subtle differences from the original Kramer production line guitar and small differences when compared to the AXN™-83’ Custom. The 83' Standard has modern features taken from our line current of AXN™ Guitars and The 83' Standard also offers a variety of tone-woods available. We kept the exact technical specifications of the original 1983 Baretta as a foundation. Improvements included in the Standard Model AXN™-83'S are some of the same features used live by the artist for which the 1983 Signature Kramer Baretta was designed. This guitarist was known to experiment with details, including the wood types, of his touring guitars tweaking them to his personal tastes and liking. For the AXN™-83’ Standard a basswood, swamp ash and northern ash wood and prime alder are offered. These woods deliver a powerfully thick amplified tone in a live setting. We are the only luthiers that have intimate knowledge of some of the details or the original. 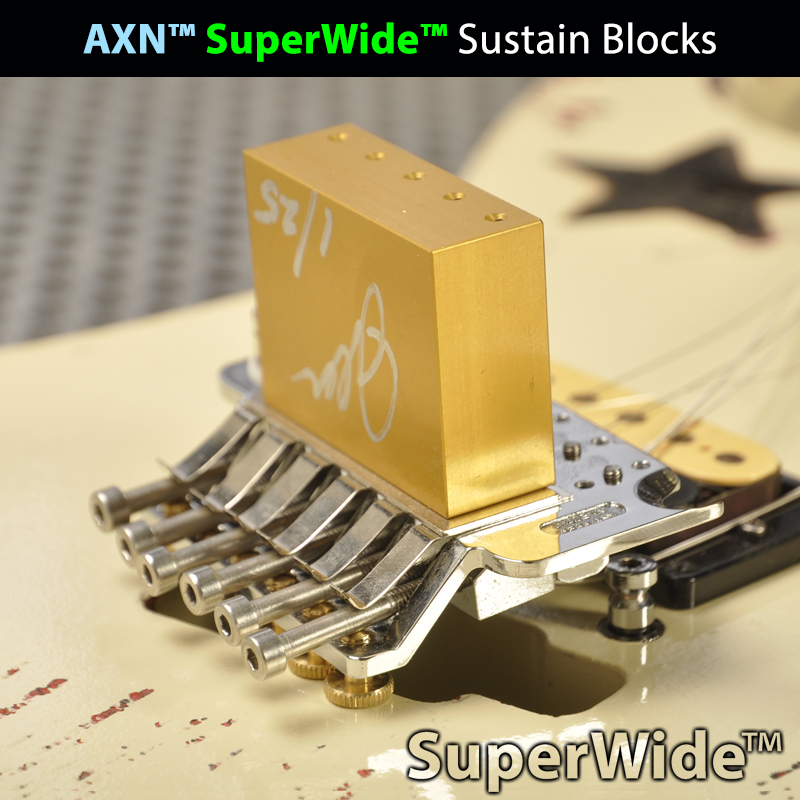 We applied modern touches to features such as our AXN™ SuperWide™ Boutique Sustain Block. We utilize the highest quality hand chosen exotic AAA-grade woods. 1980s style oil finish provides that same feel on the back of the neck. These elements reached and exceed, by far, the precision, hardware and wood quality and setups used by Kramer back in the day. The AXN™ 83' guitar is the only guitar that includes the Exact Holy Grail Hockey Stick headstock. Our AXN™ 83' has the exact neck shape, neck profile and the exact fretboard radius. It has the same paint type and formulation as well as each and every guitar technical specification of the original… Without compromise. The Standard 83’ has a choice of nut size including 1-5/8”, 1-11/16” nut. An alder wood body, a maple, swamp ash and northern ash as well as a basswood body offer some variety to our Standard 83’. Every AXN™ guitar body is 2-piece center-joined construction. The first AXN™ 83' will be obtainable in Creme for 2019. The AXN™-83 is the ultimate tone-monster and comes 100% ready to be used live at an arena gig or just cranked at maximum volume in your bedroom studio! No other guitar manufacturer has the intimate details of the 1983 Baretta in their toolbox. ALL other guitar makers lack the skillset and just plain out don’t know enough about the 1983 Baretta to recreate this guitar accurately. Nor do they care to. In regards to Kramers, none of the big guitar makers have displayed one inch of pride or integrity in their work. They source-out the manufacturing and the design to third world sweat shops. They purchased the Brand Name but don’t posses the enthusiasm to manufacture this guitar true to the original. All evidenced by many inaccurate, carelessly imprecise and just plain repugnant versions of Kramers we’ve seen in recent years. My AXN™ is a new guitar that is made in the USA with pride and includes a new Floyd Rose Germany tremolo system. Our guitars are backed by a one year warranty and our AXN™ performance guarantee. I promise you will not be disappointed. News Feb. 2019 : The Standard Model AXN™-83' Has Launched and is delivering.